Kim Kardashian was pictured yesterday at the 2nd annual derby spectacular celebration and she was wearing House of Harlow! Kim was wearing the Black Resin Triangle Necklace. Nicole Richie has also been seen wearing this House of Harlow necklace and it is available at Kitson but it is on back order so it is a very popular piece from the collection! 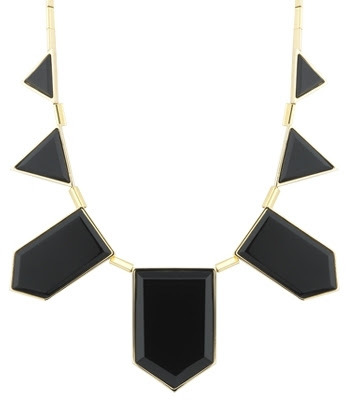 Cick here to purchase the House of Harlow 1960 black resin triangle necklace for $68 from Kitson. Hi! Isn't it the leather version she's wearing ?